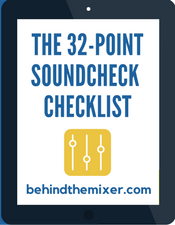 Have you ever wondered how a live audio engineer got a particular sound, when you attended a concert? Do what Brian and Chris do, just ask! In today’s episode, the guys talk about how much you can learn by attending live events and listening with a critical ear. They also talk about how they talk with those engineers either before or after a concert – and how you can, too! Right-click here and Save-As to download to your computer.